The leader of the free world is off to make peace in the East but the possibility of a trade war looms in the West. Before hastily setting off on Air Force One early from the Quebec resort summit for Tuesday's sit-down in Singapore with North Korea's Kim Jong Un, Trump spoke to a gaggle of reporters claiming the annual G-7 gathering could be reduced to "G-6 plus one" ... a clear knock at its neighbor Canada. Then Trump hit an assortment of topics, including trade, North Korea and kept pushing for the reinstatement of Russia, which had been tossed from what was then the G-8 in 2014, after the country annexed Crimea and endorsed pro-Russian separatists in Ukraine. Trump delivered off-script comments as he was leaving a G-7 summit in Canada, a meeting at which he was at odds with U.S. allies on issues such as trade. 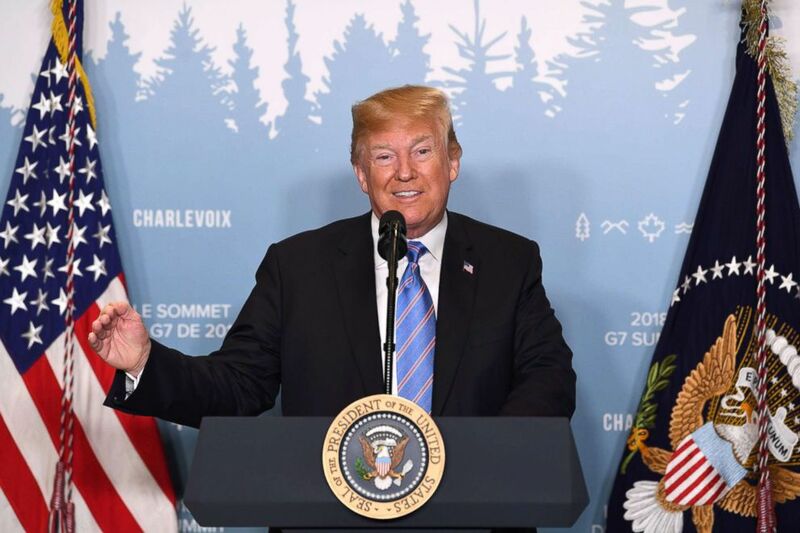 The president said at a press briefing in Quebec that his relationships with the other highly industrialized nations in the G-7 are all very strong despite disagreements over recent U.S. tariffs. When the topic of a trade war flaring up as a result of hiked tariffs that Trump promised to enforce, he declared that European countries and Canada need the U.S. more than the country needs them. "We would win that war thousand times out of a thousand," he said. He added, "If they retaliate they are making a tremendous mistake." 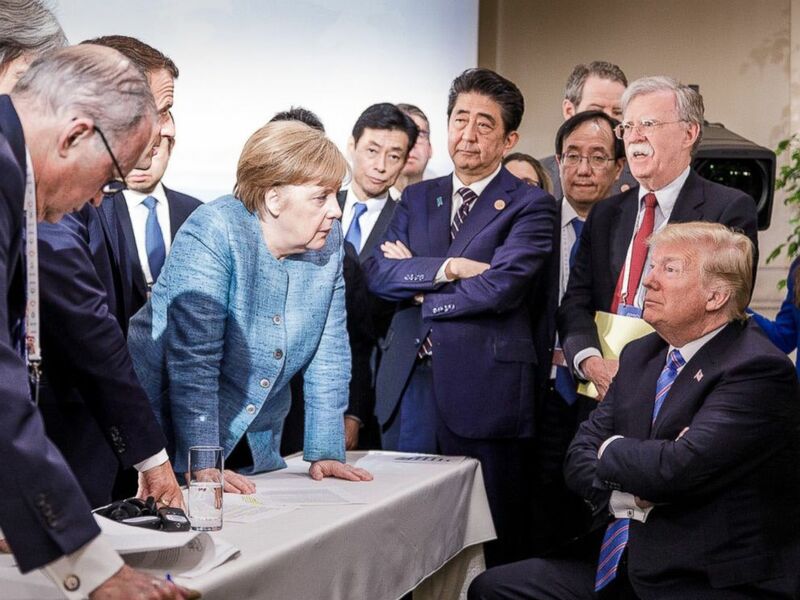 In terms of the relationships between the group of G-7 leaders, Trump called it "a perfect 10" on a scale between "zero and 10." Steffen Seibert posted this photo on Twitter showing world leaders at the G-7 summit on June 9, 2018, in La Malbaie, Quebec, Canada. The president appeared to leverage those strong relationships and convince countries to agree with the idea of curbing tariffs and government subsidies altogether. "That's what you learn at the Wharton School of Finance," said President Trump. Canadian Prime Minister Justin Trudeau appeared to be engaged in a war of words (and tweets) with Trump, whose country hosted the meeting and publicly targeted to get slapped with higher tariffs on its steel and aluminum imports. "If they retaliate, they're making a mistake, Trump warned. In a separate press conference, Trudeau said that all seven leaders signed a joint declaration despite "some strong, firm conversations on trade, and specifically American tariffs." He informed Trump that Canadians “who stood shoulder to shoulder with American soldiers in far-off lands” do not take lightly the idea that the tariffs are for national security reasons. “It’s kind of insulting,” Trudeau said. 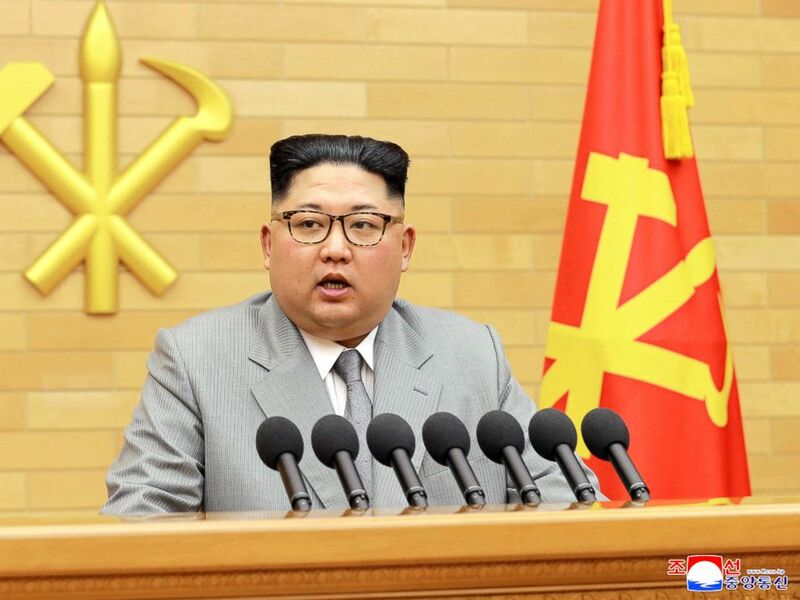 North Korean leader Kim Jong Un delivers his New Year's speech at an undisclosed place in North Korea, Jan. 1, 2018, in this photo provided by the North Korean government. Soon after the statement, Trump tweeted out that he was rescinding the declaration, and took shots at the Canada's leader for making for his handling of the truth. "Based on Justin’s false statements at his news conference, and the fact that Canada is charging massive Tariffs to our U.S. farmers, workers and companies, I have instructed our U.S. Reps not to endorse the Communique as we look at Tariffs on automobiles flooding the U.S. Market!" Then, Trump followed up with another Trudeau-targeted tweet, calling him "meek and mild" during the summit in Montreal and also "very dishonest and weak." He said that the need for the tariffs imposed on Canada are "in response to his of 270% on dairy." In terms of Russia, Trump declared, deserves back in the club of nations. "I think it would be an asset to have Russia in," he said. "I think the G-8 would be better." He went on to say that the purpose of the summit would "be more meaningful with Russia." The president's comments were only cut short after his Director of the National Economic Council, Larry Kudlow, shouted over to him, "Mr. President, you have a plane to catch." President Donald Trump said Saturday that North Korean leader Kim Jong Un has a “one-time shot” at reaching a deal with the United States. “I really feel confident. I feel that Kim Jong Un wants to do something great for his people and he has that opportunity and he won’t have that opportunity again,” Trump said at a press briefing before leaving the G-7 meeting in Quebec. The president’s remarks come two days after he said he “doesn’t need to prepare very much” for the meeting which the U.S. hopes will lead toward an agreement for North Korea to end its nuclear program. Trump said what matters more is the “attitude” he and Kim have going into the meeting. When Trump was asked by a reporter Saturday if he is concerned that he is giving Kim a “win” on the world stage just by having the meeting, the president said he’s not concerned because “we haven’t done anything” yet. President Donald Trump speaks to reporters on June 9, 2018, during the G7 Summit in La Malbaie, Quebec, Canada. “Everyone said, you know, the haters, they say, ‘Oh, you’re giving him a meeting.’ Give me a break, OK? There’s nothing,” he said. The president also said no issue concerning both countries is off limits come Tuesday. “We’ll raise every issue,” he said. The highly anticipated meeting is scheduled to be held at the luxury Capella Hotel on Singapore's Sentosa Island. ABC News' M.L. Nestel contributed to this report.